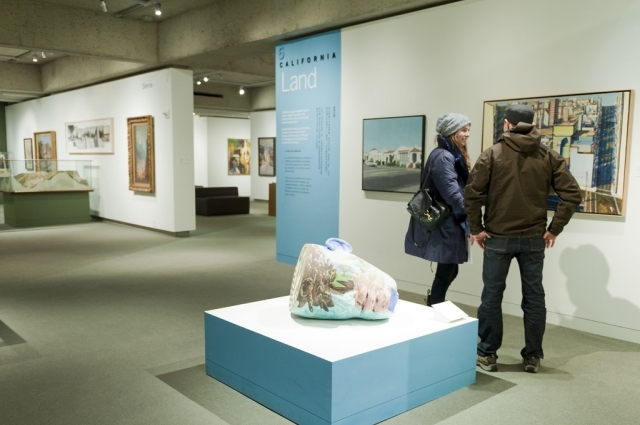 The Oakland California Museum of Art houses an eclectic collection of art from over the decades in which the Bay Area was thrusted onto the American cultural landscape. The California Venus best summarizes this forward march and its homage to classical Western fine art and its ancient lineage toward Greek Antiquity. Yet, culturally speaking, the Bay Area is notorious for its leftward political bend. It’s a curious thing, yet the museum does not give us any answers as to why the 1960’s was such a strong magnet for off-roading youngsters who did not want to buy into the system their parents had built and paid for. Then again that would be very hard to discover just from the art itself, but it would be possible to make such a curation feasible and fulfill the museum’s namesake. In any case, when focusing on post-modern art, the museum has a pleasantly surprising collection of tasteful works, infused with the slight burnt edges of irascibility (Utopia Cannibal.com from 2000 comes to mind) but does a very good job in showing restraint with the subjects. The works and the artists who created them are not what anyone would consider being condescending, if they are being commentary. There is striking elegance in Abstraction, such as Free State which is a silver acrylic captured stunningly in the light which has its color rendered metallic and giving a sense of endurance to the work and therefore a sense of invulnerability to the titular ideal. Also, there is the gorgeous sculpting of paint on canvas from a newly discovered artist Joan Brown who worked in the 60’s. Her females are a better rendition of de Kooning – and arguably her compositions are stronger in general by comparison. She works much simpler with thick textured paint that is inviting rather than de Kooning’s sometimes distractions. And her compositions are much bolder in size than his. And what is best are the noticeable strokes which are not so much brushed but carved onto the canvas, making for a superb example of a mid-centuries artist bored of having to fiddle with perfect uniformity of the colored space and is satisfied that her audience does not care for the quotidian subject matter but cares more for the vividness she can breathe into it.